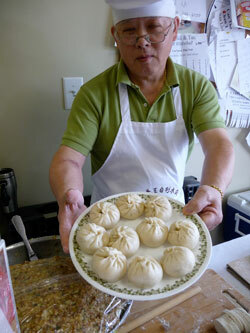 Walk inside Zen International Market & Tea in south Charlotte on a Sunday morning and the first person you’ll see is Jason Wang, deftly hand-making Chinese pork-and-cabbage buns. Wang is 58 years old, here in Charlotte from his native Taiwan for eighteen years now. His Chinese first name is Chi-Chia – “Jason” is easier for American tongues. All week he cooks at Wells Fargo / Wachovia’s giant office complex near UNCC. Sundays find him at Zen, happily chatting with shoppers in Mandarin and some English. He began with dumplings, what Americans call “pot-stickers.” Indeed he still makes them under the title “Old Wang’s Homemade Dumplings,” sold in the freezer case at Zen Market. Steamed buns are a doughier variation. On Saturdays Wang pre-makes the filling, lots of crisp Napa cabbage mixed with chopped pork, salt and spices. Sunday mornings he assembles the buns – a hand ballet that moves almost faster than the eye can see. Wrapper dough is rolled out very thin with a simple dowel of a rolling pin. A short bladed knife scoops up filling and smoothes it in the wrapper. Then the dough is folded into a ball shape, with a swirling crimp in the top. About fifteen minutes in the steamer and the treat is ready to eat. Ten warm buns — lunch for you and a friend or two — cost just $4.49.